In today's update, I'll be talking about new stretch goals and the "core four" classes. 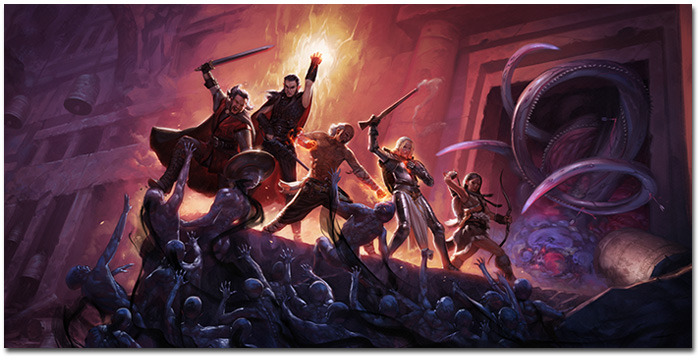 We also have some fantastic art for you that illustrates five of our adventurers engaged in some classic dungeon exploration. 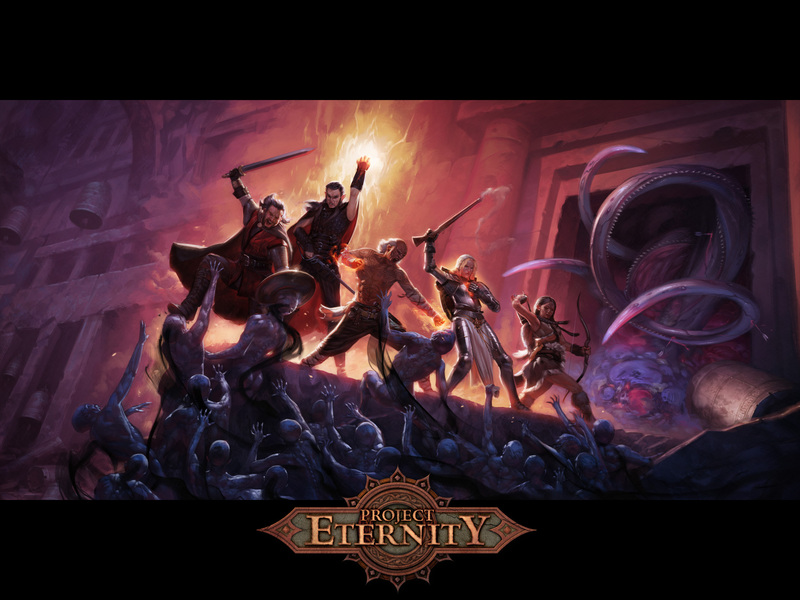 Other great stuff going on includes Tim Cain’s reddit on combat and you can now pledge with PayPal over on the Project Eternity Site. And, for our Polish- and Russian-speaking fans - we are very happy to announce that distributors in Poland and Russia will be handling localization for these two languages, so we will be able to provide them without requiring a stretch goal! Please note that pledges made through PayPal will not show up on our Kickstarter page, though we will count them toward stretch goals at the end of the campaign. Since the days are counting down, we'd like to introduce two new stretch goals. 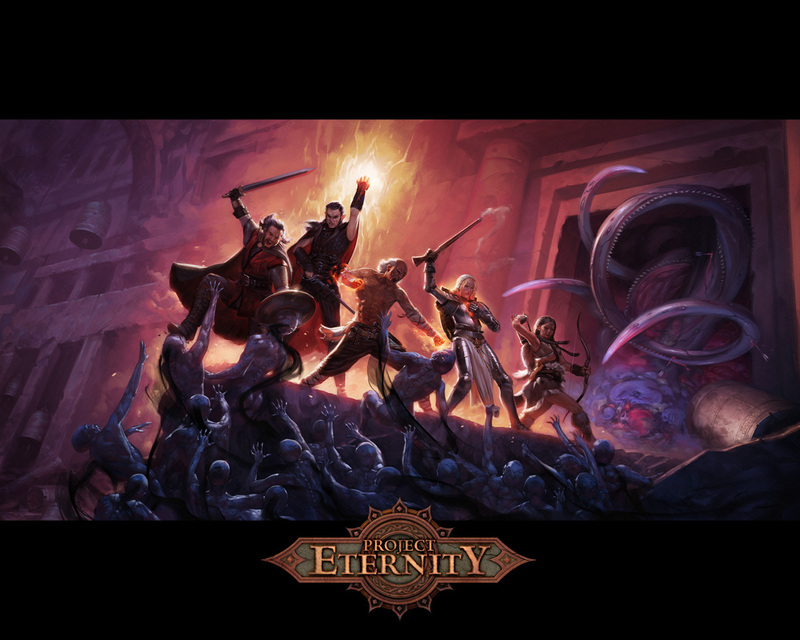 As you'll read in a few more paragraphs, Project Eternity is currently slated to support seven classes. 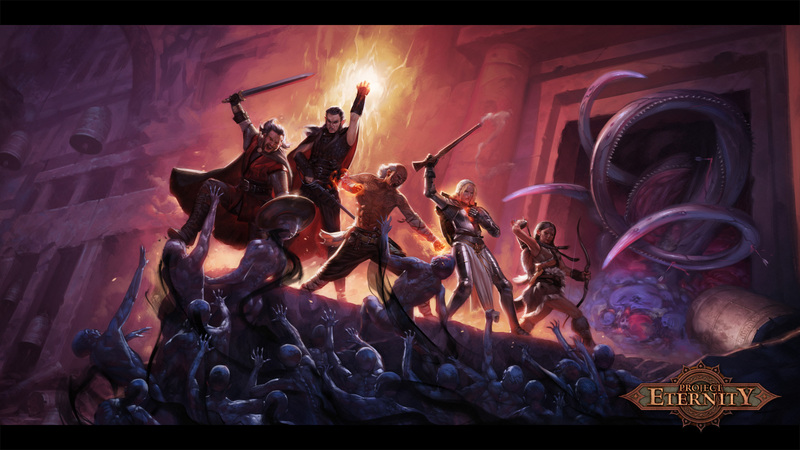 Our current roster includes fighters, priests, rogues, wizards, rangers, monks, and druids. We believe this represents the common core and several popular secondary classes that many players enjoyed using in the Infinity Engine games. 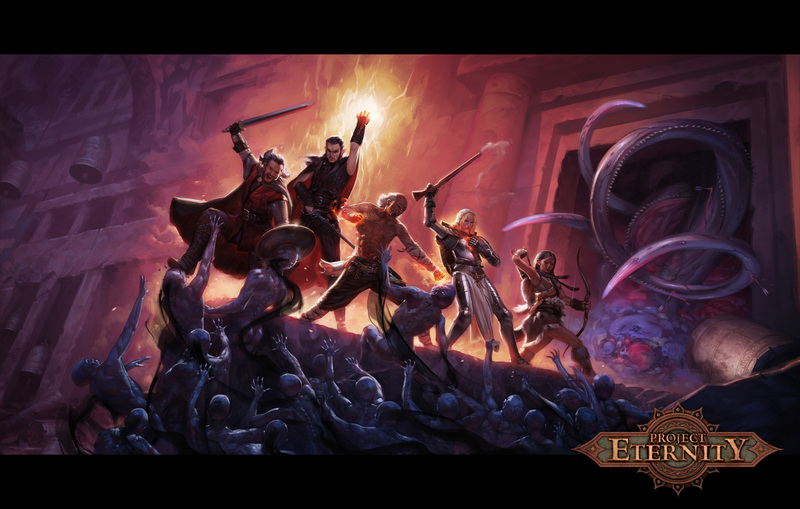 We would like to use our $2.5M stretch goal to include two additional classes: the barbarian and the cipher. Barbarians come from many of the more remote cultures found across the world. In the Dyrwood, they are commonly found among Glanfathan elf communities. They are distinguished from fighters by their recklessness, ferocity, and their predilection to substitute raw aggression for discipline. Barbarians are a challenge to deal with on a battlefield, though they are vulnerable to exhaustion if they don't pace themselves. Ciphers are uncommon and often misunderstood individuals with extraordinary mental abilities. Like wizards and priests, they have many talents that draw directly from their souls, but ciphers have the unique ability to peer through the spiritual energy of the world to manipulate other souls. While wizards use complex formulae in large tomes and priests tap into the passion of their faith, ciphers are able to operate directly through the power of their minds... and yours. But wait, we're not done yet! We've been reading a lot of feedback online about classes, companions, and party composition options. We want to give people the ability to build their parties as they like and we also want to allow people to experience the full spectrum of class mechanics. Companions go a long way toward achieving that goal while also providing a ton of reactivity in the world. Even so, we'd like to do more. At $2.6M, we will add an Adventurer's Hall to the world. In the Free Palatinate of Dyrwood, adventurers and mercenaries from across the world are often employed as personal bodyguards, elite security, or salvage (plunder) teams that venture into the forgotten corners of Eír Glanfath. A lot of the folks who hang out as such places are robbers and miscreants, but reliable agents can be found and employed with a bit of patience. What does this mean for you? It means that if you don't like a companion, or if you don't like any of our companions, you won't be cut off from having characters of their classes. Over time, you can build your own custom parties to play through the game. If you want a party of monks or all casters, this gives you the ability to do it within the game while still maintaining the pacing of the standard PC + companions play style. 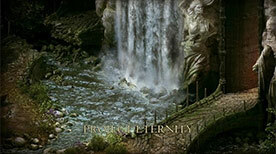 Classes in Project Eternity are meant to provide a general framework for character types. Different classes excel in different areas, but the framework can be extended and elaborated on in a multitude of ways to create characters with unique capabilities. If you see a fighter, chances are good that he or she is going to be able to take a lot of damage, but that's about all you can be sure of. If you see a wizard, he or she probably has some hard-hitting spells that can cover a large area, but his potential list of capabilities is vast. If you want to create a wizard who wears plate armor and hacks away with a broadsword from behind a heavily-enhanced arcane veil, we want to let you do that. If your idea of the perfect fighter is one who wears light armor and uses a variety of dazzling rapier attacks in rapid succession, we want to help you make that character. So it's good to think of Project Eternity's classes as being purpose-ready but not purpose-limited. To date, through our Kickstarter campaign, you have helped us fund seven classes. In our design, we started with the "core four" because they are the most broadly familiar and also some of the most versatile: the fighter, the priest, the rogue, and the wizard. To these four, you helped us add three specialized, but popular, classes: the ranger, the monk, and the druid. The design of each class has a solid, distinctive base set of abilities that remain in most builds, but will have a large number of optional specializations and alterations to give players a high level of flexibility in developing an individual character's particular style. Fighter - Fighters are men and women trained to use a wide variety of traditional weapons in brutal combat. They are often put in -- or put themselves in -- harm's way and are built to take an extraordinary amount of punishment. Though not traditionally as mobile as the monk nor as likely to dish out individually withering attacks as a rogue, fighters are dependable and flexible, able to shift between a variety of attack modes that alternate between high damage, maintaining a strong defense, weakening opponents, and dealing harsh retribution to those who attack his or her allies. Some fighters build up arsenals of feints, knockdowns, and special attacks rather than rely on the “slow and steady” approach. And while fighters are often thought of as being primarily melee-based, they can specialize in a variety of weapons, including bows, crossbows, and even firearms. They're unlikely to outclass rangers at their own game, but fighters can be almost as dangerous at a distance as they are up close. Though it may not look like it to see them in battle next to wizards and priests, fighters are just as able to tap into the power of their souls to devastating effect: accelerating their attacks to a superhuman speed, striking foes with such power that nearby opponents are knocked off their feet, and maintaining a phenomenal endurance that allows them to rapidly bounce back from even terrible wounds. When they aren't locked in life and death struggles, fighters are, unsurprisingly, often quite athletically capable. Even so, it's not uncommon to find fighters who are stealthy and well-educated. Moving unseen and knowing how to get out of a jam can come in handy even for them. Priest - In a world with many gods, there are many different types of priests. Though the majority of priests spend their time tending to worshipers or engaged in relatively peaceful pursuits, there are ranks of dedicated adventuring or mercenary priests who have turned the flame of their faith into a spark to ignite the power of their souls. Such men and women have found a divine link to their chosen deity, but their abilities stem solely from within. Dedicated to spreading the news of their gods' dominions in the realms of mortals through their own deeds, adventuring priests thrust themselves into lethal conflict to prove their worth. Often trained to fight alongside soldiers of their respective churches, priests are capable in the fray (and near the fray, for those who follow less melee-oriented faiths), but their true power comes from their prayers, faith-inspired miracles that aid their allies and punish their enemies. These miracles range from combat blessings, weapon enchantments, and protective barriers to divine summons, sanctified wards, and crippling curses. In many ways, the prayers of priests have almost as much variety as wizards spells, though priests are restricted to invoking prayers that are aligned with their faith. Additionally, priests often specialize in the weapons, armor, and litanies of prayers most beloved by their church. Thus, the multitude of gods produces a multitude of different priests, each with their own unique array of abilities. Most priests are church-educated and are widely versed in many types of lore. However, some priests get by on pure faith alone, having little knowledge of the world around them. Such battle priests often lean more heavily on their athletic abilities when they are in the field. Rogue - Contrary to what their name might imply, rogues come from many walks of life. They are cutpurses, thugs, and courtesans but also aristocrats, diplomats, and personal guards. Often separated by station in life, they are united by their reliance on wits, speed, and subterfuge to achieve their goals. The way of the rogue is not to stand toe-to-toe with the biggest brute in the room and exchange body blows, but to glance away in feigned confusion and slip an unseen blade between the brute's ribs as he turns his attention. When a room explodes in a storm of fire, the fighters grit their teeth, the priests pray for salvation, and the wizards fumble to find a spell to protect them, but the rogues just... disappear. They excel at being in the one place where no one's looking, at kicking people when they're down, at taunting a foe into turning its back on the rogue's ally while he or she nimbly skips away, and at being just too damned slippery to pin down. Whether they pack a pair of daggers, a fine rapier, a slim bow, a stubby pistol, or a brutish club, rogues haul a carnival of pain with them wherever they go. If their natural tendencies weren't dangerous enough, their affinity for skullduggery allows some talented rogues to tap into their souls to perform amazing stunts: fading from view in plain sight, briefly cloaking their allies in a veil of shadow, imbuing their weapons with a soul-eating venom, or even becoming so insubstantial that blades barely hurt them. While rogues are known for their stealthy nature both in and out of battle, many of them are quite talented with machines and contraptions of all sorts. High-born rogues are often very knowledgeable about esoteric, while many low-born rogues are well-equipped to survive in the wild. Wizard - Widely respected in most societies, wizards of Project Eternity are men and women of high education and extreme mental discipline, if not always outright intelligence. Wizards are sometimes called navigators of the mortal soul, charting out and practicing the precise ways in which “ordinary” people can unlock the power inside of themselves. Using their knowledge to truly spectacular ends, wizards rely not only on ancient practices but also their own research to propel them forward. Far from being occult or protected knowledge, most wizards' spells are just so incredibly complex and physically demanding that even practiced wizards cannot invoke them without the use of expensive, specially-enchanted tomes. That's all for our class update, but we wanted to give you a piece of art to show you examples of characters you may encounter (and adventure with) in Project Eternity. We hope you enjoy this fantastic painting from Kieran Yanner, and we have wallpapers of the art available in different resolutions.